Between the 2nd century bce and 2nd century ce the majority of the Dead Sea Scrolls were written. During this time, different Judean groups struggled to obtain and maintain political and religious leadership. As primary sources, the Dead Sea Scrolls shed light on these historical events and explore the ways that various Jews of the Second Temple era related to the world around them. The Scrolls clarify our understanding of the fundamental differences between different Jewish sects, such as the Pharisees, Sadducees, and Essenes. 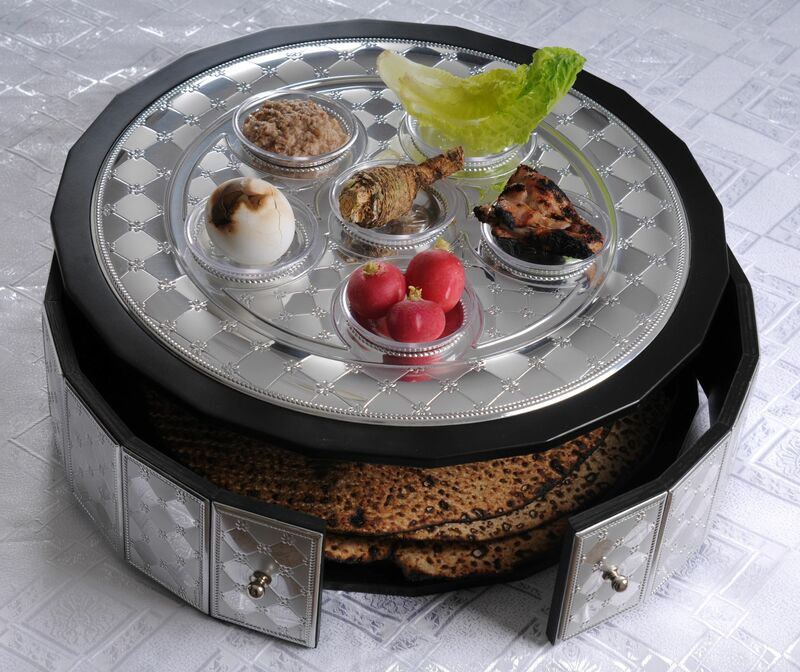 All of the ancient Jewish groups seem to have agreed about the centrality and importance of the Bible, although their conceptions of sacred literature may have differed. On the other hand, the non-biblical texts show profound discrepancies in the ways that the different groups interpreted their Scripture and obeyed its guidelines. They further our knowledge of ancient biblical interpretation and the effect of historical events on religious life and ideas. The texts shed light on philosophical disputes about issues such as the Temple and priesthood, the religious calendar and the afterlife. More practical disputes were focused on everyday law and observance. Among the Scrolls are partial or complete copies of every book in the Hebrew Bible (except the book of Esther). About a dozen copies of some of these holy books were written in ancient paleo-Hebrew (the script of the First Temple era, not the standard script of the time). Many biblical manuscripts closely resemble the Masoretic Text, the accepted text of the Hebrew Bible from the second half of the first millennium ce until today. This similarity is quite remarkable, considering that the Qumran Scrolls are over a thousand years older than previously identified biblical manuscripts. Now they are presented on line for the general public by the Israel Antiquities Authority and Google at the Leon Levy Dead Sea Scrolls Digital Library website. The Israel Antiquities Authority library dates to the time of the British Mandate, probably in 1926, when a decision was reached to sever the British School of Archaeology in Jerusalem from the Department of Antiquities (Palestine Government). Until that year the two institutions were managed by a single director, Professor John Garstang, who was the first director of the British School of Archaeology in Jerusalem, starting in 1919, and of the Department of Antiquities from 1920. In 1926 Garstang resigned from the former institution and became the full-time director of the Department of Antiquities. During the 1930’s the library underwent a dramatic change after John D. Rockefeller Jr. donated two million dollars in 1929. Thanks to another generous contribution of approximately fifty thousand dollars, books and periodicals were purchased, some of which were rare and hard-to-come by for that period. This donation also permitted the library to expand its areas of expertise (among those recommending specific books for the library was Professor William F. Albright). These turned the library in the “Rockefeller Museum” into the most important archaeological library in the Middle East. In 1990 the library of the “Israel Department of Antiquities and Museums” became the “Israel Antiquities Authority Library”. The Israeli library was directed from 1948 by Dr. Milka Cassuto-Saltzmann (1948-1973), Mrs. Wanda Aftergood (1973-1982), Mrs. Giovanna Barouch (01.11.1982-30.04.2002) and Mr. Baruch Brandl (1.5.2002 –to the present). Today the library houses the oldest and most extensive collection of publications on the archaeology of the Land of Israel, including: reports of archaeological excavations in the Land of Israel and neighbouring countries, e.g., the Ancient Near East and Egypt. There are over 25,000 volumes and archaeological reports and over 1,000 different periodicals in the library’s collection. The amount of titles in the library numbers in excess of 100,000. The computerized library will soon be upgraded with the “Aleph 500” system. With the transition the catalogue will also be changed to MARC, searches will be conducted in a “Windows” environment and one will be able to access references in libraries both in Israel and abroad. The importance of the library has grown with the computerization of more than 70,000 articles and their analytical sorting. The Dead Sea Scrolls Publication Project, whose conclusion the library is marking at this time, deals with c.15,000 scrolls and scroll fragments in the Rockefeller Museum, in Jerusalem, that were turned over to the State of Israel following the Six Day War (1967). Close to the time of its establishment, more than a decade ago, the Antiquities Authority decided to take upon itself the matter of attending to the scrolls, to which it ascribed the utmost priority. After measures were taken to improve the security of the scrolls and the conditions in which they were stored, it was decided that three issues relating to them required radical and fundamental treatment. 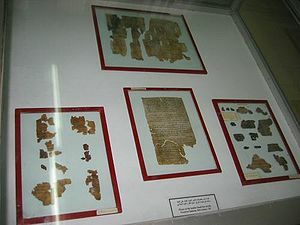 These included bringing about the complete publication of all the scrolls in the possession of the Antiquities Authority; the conservation of the scrolls in order to prevent their destruction; and an attempt to locate additional scrolls in the region of the Judean Desert and Dead Sea through archaeological surveys and excavations. The publication of the scrolls, which was completed in its entirety, is exceptional when also compared with other similar materials (e.g., the archives from Cairo, Mari and elsewhere) that have yet to be published even though they too were discovered many years ago. The conservation of the scrolls, the search for additional scrolls and the publication all demanded considerable economic resources. As part of the conservation efforts to preserve the Scrolls for future generations, the IAA has initiated the Leon Levy Dead Sea Scrolls digitization project. The project was made possible by an exceptionally generous grant from the Leon Levy Foundation, and further contribution by the Arcadia Fund, as well as the support of the Yad Hanadiv Foundation. Using the most advanced and innovative imaging technology, each Scroll fragment is imaged in various wavelengths and in the highest resolution possible then uploaded to the Digital Library. For the first time ever, the Dead Sea Scrolls archive is becoming available to the public online. Unfortunately the researchers were unable to convince the government, especially the Ministry of Education and Culture and the Ministry of Science, as well as other entities such as the National Inheritance Foundation, to provide them with assistance and in any case they were compelled to solve all questions concerning funding with their own meager resources and philanthropic contributions. They were also aided in this matter by organizing exhibitions of the Dead Sea Scrolls abroad. You can imagine they still can use a lot of funds. After more than 6 decades since the discovery of the Dead Sea Scrolls, Israel has put 5,000 images of the ancient biblical artifacts online in a partnership with Google. The University of Groningen in cooperation with the Qumran Institute organizes an exclusive exhibition on Dead Sea Scrolls. The exhibition shows original Biblical manuscripts and objects from the third century BC to the first century AC. “Only five conservators worldwide are authorized to handle the Dead Sea Scrolls,” said Shuka Dorfman, director of the Israel Antiquities Authority. “Now, everyone can touch the scroll on screen around the globe.”Last year, Google partnered with the Israel Museum to put five scrolls online.The scrolls, considered one of the most significant archaeological finds of the 20th century, are thought to have been written or collected by an ascetic Jewish sect that fled Jerusalem to the desert 2,000 years ago and settled at Qumran, near the shore of the Dead Sea. The hundreds of manuscripts found in caves near the site have shed light on the development of the Hebrew Bible and the origins of Christianity.Google says the new digital library took two years to assemble, using technology first developed by NASA. The multimedia website allows users to zoom in on various fragments, with translations and Google maps alongside.Google hopes to further expand its project. Two months ago Google launched a “Cultural Institute,” a digital visual archive of historical events in co-operation with 17 museums and institutes around the world. 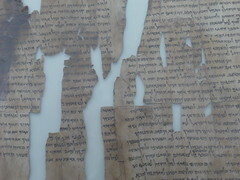 For many years after Bedouin shepherds first came upon the scrolls in caves near the Dead Sea in 1947, only a small number of scholars were allowed to view the fragments.But access has since been widened and they were published in their entirety nine years ago.A few large pieces of scroll are on permanent display at the Israel Museum in Jerusalem. The site of Khirbet Qumran (a modern Arabic name) is located in the West Bank, near the northern edge of the Dead Sea, and is the place where the Dead Sea Scrolls were found in nearby caves.The first settlement was created during the Iron Age, but was abandoned about 2,600 years ago, long before the scrolls were made. A virtual view of the northeast corner of the reconstructed Khirbet Qumran fortress, facing southwest towards the caves. 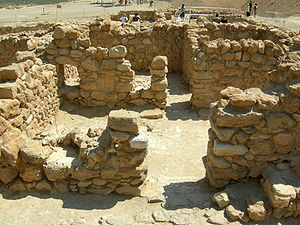 Archaeological work indicates that a second settlement existed between roughly 100 B.C. and A.D. 68, when it was captured by the Roman army and destroyed in a fire. Cincinnati’s unique part in the story of the Dead Sea Scrolls will be highlighted in the exhibition. Hebrew Union College and its former president (1947-71) Nelson Glueck played an important role in efforts to recover some of the scrolls from antiquities dealers, authenticate the scrolls, in early academic debate about the significance and dating of the scrolls and participation in scholarly efforts surrounding the scrolls.The Cincinnati Museum is the third stop of the exhibit’s national tour and is the only regional venue to host the exhibition. The phrase is now found in some of these scrolls as a self-designation. Understanding that etymology can help illuminate the history of religious groups of that era. For detailed references and quotations, one may google my online article “Others and Intra-Jewish Polemic as Reflected in Qumran Texts” from The Dead Sea Scrolls: A Comprehensive Account (Leiden: Brill, 1999). This entry was posted in Archaeology, History and tagged 2° Century, 2° Century bCE, British School of Archaeology in Jerusalem, Dead Sea, Dead Sea Scroll, Google, Hebrew Bible, Israel, Israel Antiquities Authority, Israel Antiquities Authority library, Israel Department of Antiquities and Museums, Jerusalem, John D. Rockefeller Jr., John Garstang, Judean Desert, Leon Levy Dead Sea Scrolls Digital Library, National Inheritance Foundation, Qumran, Rockefeller Museum, Yad Hanadiv Foundation. Bookmark the permalink.